Thread: how to repair marks? So my 1996slt doesnt look like the best ski out there. Everyone here knows that polaris didnt really have the ahhh nicest colors on these ski's. 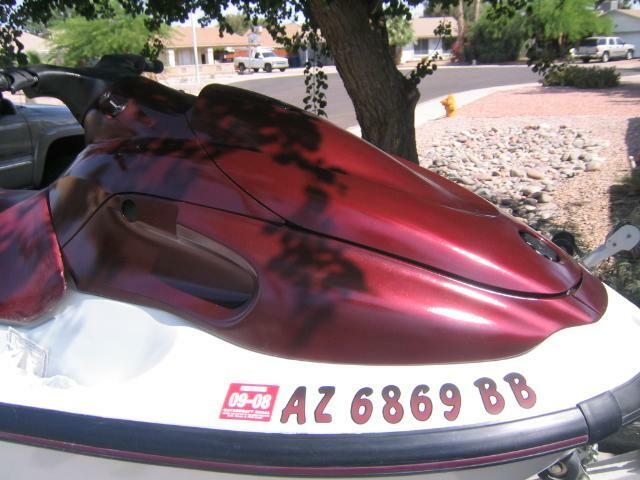 Anyways over the years mine has take a few dings off of docks and so on, and i was just wondering if anyone knows of an easy way to repaint the marks, or help clean the ski up to look better again, even the plastics have been damaged by the sun, the guy that had it before me didnt have it covered and well everyone knows what happens. On the cheap u can use auto touch up paint to paint a whole ski! the trick is to spray a real 2 part clearcoat over the rattle can paint here is one example plus new seat covers and some hydro turf this ski looks new! My SLT 750 looked as ugly as could be when I bought it. It looked like no one ever did anything to it.It had been sitting with a poly tarp on it and was covered with black mold? or mildew and oxideization. After power washing,I took a wheel with a wool bonnet and Meguris and wheeled it out,including over the decals.lightly.80% improvement.Still had water stains near rub rails and under seat edges,etc. I went back with Turtle Wax Rubbing Compond,the old hand rubbed type (orange)and went at it,to my surprize,it took off all the junk with little work,rub it on,give it a few minutes and hit it again,GONE.90 % improvement. Then I went with the new Turtle Wax ICE Liquid Clay,Rubbed it with normal hand effort.Looking almost new.Then applied on the new Turtle Wax ICE WAX (even used it on the rub rail,lost the fading of color), and if this ski had new decals it would look showroom. I think so far this stuff is the whip. Plastic trim like rub rails can be brought back to life with a heat gun from what I've read. Not too much that you melt it, so experiment and see what happens.